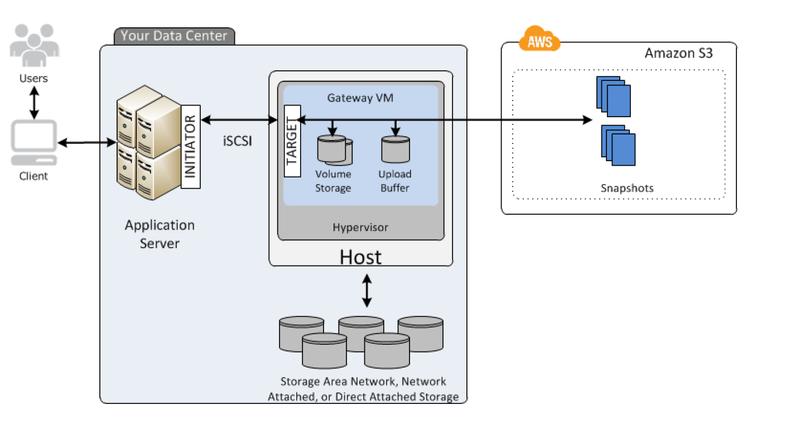 AWS Storage Gateway connects on-premises software appliance with cloud-based storage to provide seamless integration with data security features between the on-premises IT environment and the AWS storage infrastructure. Storage Gateway allows storage of data in the AWS cloud for scalable and cost-effective storage while maintaining data security. 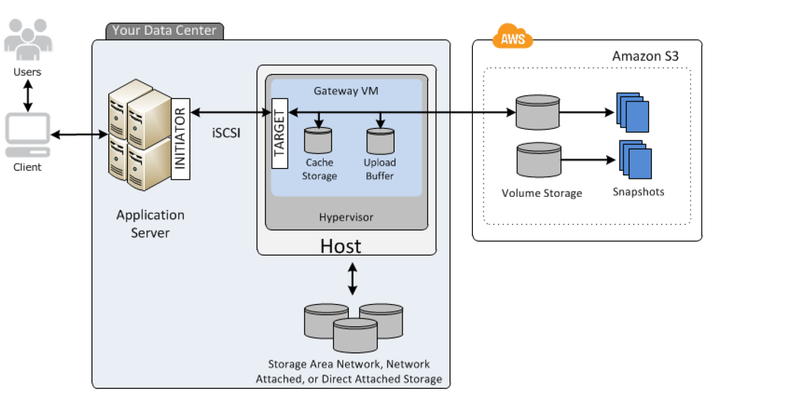 AWS Storage Gateway can run either on-premises, as a virtual machine (VM) appliance, or in AWS, as an EC2 instance. So if the on-premises data center goes offline and there is no available host, the gateway can be deployed on an EC2 instance. Gateway-cached volumes offer a substantial cost savings on primary storage and minimize the need to scale your storage on-premises. Each gateway configured for gateway-cached volumes can support up to 32 volumes, with each volume ranging from 1GiB to 32TiB, for a total maximum storage volume of 1,024 TiB (1 PiB). Gateway-stored volume configuration provides durable and inexpensive off-site backups that you can recover to your local data center or Amazon EC2. For example, if you need replacement capacity for disaster recovery, you can recover the backups to Amazon EC2. 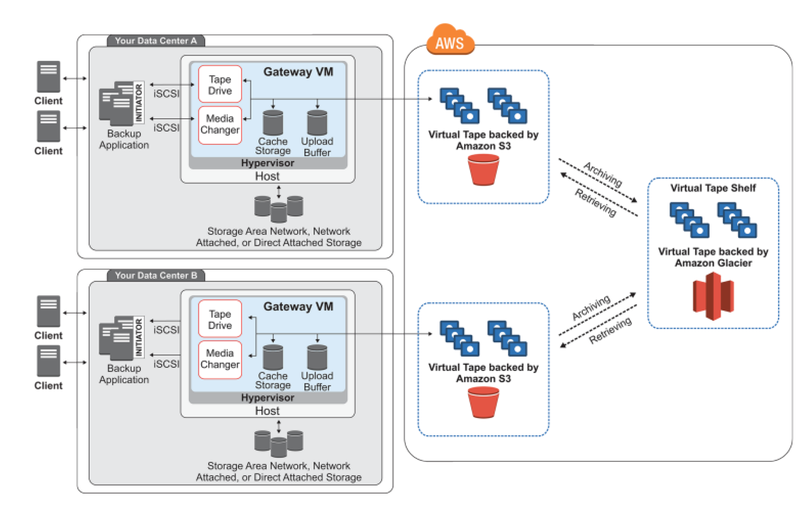 Gateway-VTL provides cost-effective and durable archival of backup data in Amazon Glacier. Gateway-VTL provides a virtual tape infrastructure that scales seamlessly with the business needs and eliminates the operational burden of provisioning, scaling, and maintaining a physical tape infrastructure. VTL interface lets you leverage your existing tape-based backup application infrastructure to store data on virtual tape cartridges that you create on your gateway-VTL. Each gateway-VTL is preconfigured with a media changer and tape drives, which are available to the existing client backup applications as iSCSI devices. Tape cartridges can be added as needed to archive your data. Backup software writes data to the gateway, the gateway stores data locally and then asynchronously uploads it to virtual tapes in Amazon S3. A direct encrypted connection to Amazon S3. It’s a backup solution that provides an on-premises Cloud storage. It provides an encrypted SSL endpoint for backups in the Cloud. You’re running an application on-premises due to its dependency on non-x86 hardware and want to use AWS for data backup. Your backup application is only able to write to POSIX-compatible block-based storage. You have 140TB of data and would like to mount it as a single folder on your file server. Users must be able to access portions of this data while the backups are taking place. What backup solution would be most appropriate for this use case? Use Storage Gateway and configure it to use Gateway Cached volumes. Configure your backup software to use S3 as the target for your data backups. Restore by implementing a lifecycle policy on the Amazon S3 bucket. Make an Amazon Glacier Restore API call to load the files into another Amazon S3 bucket within four to six hours. Create an Amazon EBS volume from a gateway snapshot, and mount it to an Amazon EC2 instance. Each gateway-cached volume can store up to 32 TB of data. Data written to the volume is cached on your on-premises hardware and asynchronously uploaded to AWS for durable storage. Each gateway-stored volume can store up to 16 TB of data. Data written to the volume is stored on your on-premises hardware and asynchronously backed up to AWS for point-in-time snapshots. Hi Senthil, good catch. S3 is object storage and isn’t meant to serve as a standalone, POSIX-compliant file system so glacier seems to be the only option. But the only thing unclear is the ability to be able to access data while the backup is happening. finally, accessing data while backup = this meets the feature of snapshot, b/c while snapshot of an AWS EBS is taking place, that data is accessible. actually storage GW use EBS snapshot mechanism in the background when backup data. Just curious, size of volume aside (lets say volume is 5TB)… the question states that the application is running on non x86 HW. Let’s say its SPARC/Solaris. Doesnt storage gateway present only x86 linux support? If so, then there would be no answer that would work. Gateway-stored volumes can range from 1 GiB to 16 TiB in size and must be rounded to the nearest GiB. Each gateway configured for gateway-stored volumes can support up to 32 volumes and a total volume storage of 512 TiB (0.5 PiB). Gateway-cached volumes can range from 1 GiB to 32 TiB in size and must be rounded to the nearest GiB. Each gateway configured for gateway-cached volumes can support up to 32 volumes for a total maximum storage volume of 1,024 TiB (1 PiB). I am thinking it must be A then?? C is definitely not correct. To glacier? It takes 3 – 4 hours to retrieve data.? Q5. With a 1gbps connection it takes only 10 minutes or so to download a 50GB file (even assuming only 50% line utilization). Therefore the simpler c) satisfies this RTO in a more cost-effective way, and the combination of plain S3 and Glacier handles the compliance adequately. Do you agree? Agreed, actually the confusing line in the question is actually “The time required to restore the data store from a backup is approximately 1 hour”, which is the time it takes to get the data from the backup and not the RTO which is 2 hours only for the 7 days objects and just need to store the data indefinitely. You can do Expedited retrievals. Q: What are Expedited retrievals? Expedited retrievals allow you to quickly access your data when occasional urgent requests for a subset of archives are required. For all but the largest archives (250MB+), data accessed using Expedited retrievals are typically made available within 1 – 5 minutes. There are two types of Expedited retrievals: On-Demand and Provisioned. On-Demand requests are like EC2 On-Demand instances and are available the vast majority of the time. Provisioned requests are guaranteed to be available when you need them. Yup, its the latest enchancement with Glacier where you can do expedited retrievals. Not sure if the AWS exams do keep up the pace with the latest enhancements. We are using Volume Cached Storage Gateway .We have 32TB snapshots and we need to restore now..I ddint find any direct documentation for restoring this..Any inputs will be appreciated. Hi Raj, aren’t these EBS snapshots can be directly used to create volumes and attach to an EC2 instance ? I dont think any EC2 instances supports EBS Volumes of size more than 16TB..I tried and couldn’t create it. Can I just say, Q1 was in my CSA exam and these scenario questions will do great for people studying for the exam. Though can you just make the answers at the bottom instead of putting them in bold text? Thanks Max for the feedback, I am trying to implement a format of that sorts but it would take time. Are the answers now correct? I see a lot of discussion arount Q3 and Q5. Hi Shankar, these limits keep on changing literally every quarter :). Will update the same. please explanin Q.5 i have lot of confusion. can you please mention which part is causing confusion ? Q1: Storage Gateway: “All data transferred between the gateway and AWS storage is encrypted using SSL. By default, all data stored by volume gateway in S3 is encrypted server-side with Amazon S3-Managed Encryption Keys (SSE-S3).” I believe this is saying that S3 will encrypt data at rest, not Storage Gateway. Storage Gateway and Glacier provides encryption at rest by default. With latest AWS enhancements, DynamoDB and SQS also allows encryption of data but on demand. thanks me2resh, updated the same.